This research-based clinical tool standardizes and defines the knowledge base for nursing curricula and practice, communicates the nature of nursing, and facilitates the appropriate selection of nursing interventions for nurses, including practicing nurses, nursing students, nursing administrators, and faculty. 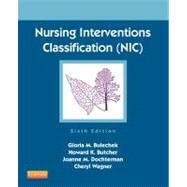 Includes 542 research-based nursing intervention labels with specific activities. Presents a definition, a list of activities, a publication facts line, and references for each intervention. Provides 34 brand-new interventions that address important topics such as defibrillator management, infant nutrition, toddler safety, and wound care: burns. Includes 77 substantively-revised interventions that supply the most up-to-date information on a wide variety of interventions, including chemotherapy management, hypnosis, radiation therapy management, exercise therapy, and shock prevention. Supplies updated and expanded lists of core interventions for 45 specialties. Each intervention now includes a publication facts line that indicates the timeline for development and revision of the intervention. A "call for reviewers" invites users to participate in future editions of Nursing Interventions Classification (NIC).